1. Start or found a new church. 4. Lead a network or presbytery of churches. 5. 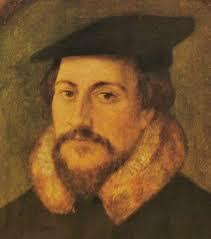 Function as the only or clearly most influential voice among pastors in the Reformed churches of his day. Categories: Bible	| Tags: 2 Thessalonians, abomination of desolation, antichrist, Daniel, john calvin, man of lawlessness, man of sin, papacy, Paul, Pope, prophecy, Roman Catholicism, Roman See	| Enter your password to view comments. Until now we have spoken of the order of governing the Church, according as it was left to us by the word of God alone. We have also treated of the ministers as Jesus Christ instituted them. Now in order that all of this be familiarly declared to us and imprinted in our memory, it will be beneficial for us to recognize what the form of the ancient Church was in all these things, considering that she is able to represent to us as in a mirror this instruction from God that we have set forth. Well and wisely, therefore, does Augustine say, “Seeing that pious reason and the mode of ecclesiastical discipline ought specially to regard the unity of the Spirit in the bond of peace, which the Apostle enjoins us to keep, by bearing with one another (for if we keep it not, the application of medicine is not only superfluous, but pernicious, and therefore proves to be no medicine); those bad sons who, not from hatred of other men’s iniquities, but zeal for their own contentions, attempt altogether to draw away, or at least to divide, weak brethren ensnared by the glare of their name, while swollen with pride, stuffed with petulance, insidiously calumnious, and turbulently seditious, use the cloak of a rigorous severity, that they may not seem devoid of the light of truth, and pervert to sacrilegious schism, and purposes of excision, those things which are enjoined in the Holy Scriptures (due regard being had to sincere love, and the unity of peace), to correct a brother’s faults by the appliance of a moderate cure” (August. Cont. Parmen. cap. 1). To the pious and placid his advice is, mercifully to correct what they can, and to bear patiently with what they cannot correct, in love lamenting and mourning until God either reform or correct, or at the harvest root up the tares, and scatter the chaff (Ibid. cap. 2). Let all the godly study to provide themselves with these weapons, lest, while they deem themselves strenuous and ardent defenders of righteousness, they revolt from the kingdom of heaven, which is the only kingdom of righteousness. For as God has been pleased that the communion of his Church shall be maintained in this external society, any one who, from hatred of the ungodly, violates the bond of this society, enters on a downward course, in which he incurs great danger of cutting himself off from the communion of saints. Let them reflect, that in a numerous body there are several who may escape their notice, and yet are truly righteous and innocent in the eyes of the Lord. Let them reflect, that of those who seem diseased, there are many who are far from taking pleasure or flattering themselves in their faults, and who, ever and anon aroused by a serious fear of the Lord, aspire to greater integrity. Let them reflect, that they have no right to pass judgment on a man for one act, since the holiest sometimes make the most grievous fall. Let them reflect, that in the ministry of the word and participation of the sacraments, the power to collect the Church is too great to be deprived of all its efficacy, by the fault of some ungodly men. Lastly, let them reflect, that in estimating the Church, divine is of more force than human judgment. 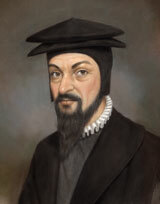 John Calvin, Institutes of the Christian Religion, Book IV, chapter I, 16. Many are induced by pride and presumption, by disdain, or by envy to persuade themselves that they will get enough benefit from reading in private, or meditating in private. By doing so, they contemn the public assemblies, and think that meditation there is unnecessary. But because they dissolve or divide, as much as is in them, the bond of unity which God wills to be kept inviolable, it is fitting that they receive the reward of such a divorce, for they bewitch themselves of all the errors and reveries which carry them to confusion. To enable faith to surmount the great difficulty, Scripture furnishes two auxiliary proofs, the one the likeness of Christ’s resurrection, and the other the omnipotence of God. Therefore, whenever the subject of the resurrection is considered, let us think of the case of our Savior, who, having completed his mortal course in our nature which he had assumed, obtained immortality, and is now the pledge of our future resurrection. For in the miseries by which we are beset, we always bear “about in the body the dying of the Lord Jesus, that the life also of Jesus might be made manifest in our mortal flesh,” (2 Cor. 4:10). It is not lawful, it is not even possible, to separate him from us, without dividing him. Hence Paul’s argument, “If there be no resurrection of the dead, then is Christ not risen,” (1 Cor. 15:13); for he assumes it as an acknowledged principle, that when Christ was subjected to death, and by rising gained a victory over death, it was not on his own account, but in the Head was begun what must necessarily be fulfilled in all the members, according to the degree and order of each. For it would not be proper to be made equal to him in all respects. It is said in the psalm, “Neither wilt thou suffer thine Holy One to see corruption,” (Ps. 16:10). Although a portion of this confidence appertain to us according to the measure bestowed on us, yet the full effect appeared only in Christ, who, free from all corruption, resumed a spotless body. Then, that there may be no doubt as to our fellowship with Christ in a blessed resurrection, and that we may be contented with this pledge, Paul distinctly affirms that he sits in the heavens, and will come as a judge on the last day for the express purpose of changing our vile body, “that it may be fashioned like unto his glorious body,” (Phil. 3:21). For he elsewhere says that God did not raise up his Son from death to give an isolated specimen of his mighty power, but that the Spirit exerts the same efficacy in regard to them that believe; and accordingly he says, that the Spirit when he dwells in us is life, because the end for which he was given is to quicken our mortal body (Rom. 8:10, 11; Col. 3:4). I briefly glance at subjects which might be treated more copiously, and deserve to be adorned more splendidly, and yet in the little I have said I trust pious readers will find sufficient materials for building up their faith. Christ rose again that he might have us as partakers with him of future life. He was raised up by the Father, inasmuch as he was the Head of the Church, from which he cannot possibly be dissevered. He was raised up by the power of the Spirit, who also in us performs the office of quickening. In fine, he was raised up to be the resurrection and the life. But as we have said, that in this mirror we behold a living image of the resurrection, so it furnishes a sure evidence to support our minds, provided we faint not, nor grow weary at the long delay, because it is not ours to measure the periods of time at our own pleasure; but to rest patiently till God in his own time renew his kingdom. To this Paul refers when he says, “But every man in his own order: Christ the first-fruits; afterward they that are Christ’s at his coming,” (1 Cor. 15:23). When it comes to us, as I said, it is necessary for us to take the certainty of our election from the gospel; because if we try to penetrate the eternal decree of God, this will be an abyss for us to engulf us. But after God has testified to us and made us to know that we are of His elect, we should climb higher, out of fear that the effect might bury the cause. For there is nothing more unreasonable, when the Scripture tells us that He has illuminated us according as He has chosen us, that this clarity would blur our eyes, to the point that we would refuse to think we are elect. Martyn Lloyd-Jones on why “The Institutes of the Christian Religion” by John Calvin ought to be read. Calvin’s main feature is that he bases everything on the Bible…he does not wish for any philosophy apart from that which emanates from Scripture. It is in the Institutes that one gets biblical theology for the first time, rather than dogmatic theology…For him the great central and all-important truth was the sovereignty of God and God’s glory. We must start here and everything else issues from here. It was God, according to his own free will and according to his infinite wisdom, who created the world. But sin entered and if it were not for God’s grace, there would be no hope for the world. Man is a fallen creature, with his mind in a state of enmity towards God. He is totally unable to save himself and to reunite himself with God. Everyone would be lost if God had not elected some for salvation and that unconditionally. It is only through Christ’s death that it is possible for these people to be saved, and they would not see or accept that salvation if God through his irresistible grace in the Holy Spirit had not opened their eyes and persuaded them (not forced them) to accept the offer. And even after that, it is God who sustains them and keeps them from falling. Their salvation, therefore, is sure because it depends, not on them and their ability, but on God’s grace. The church is a collection of the elect. 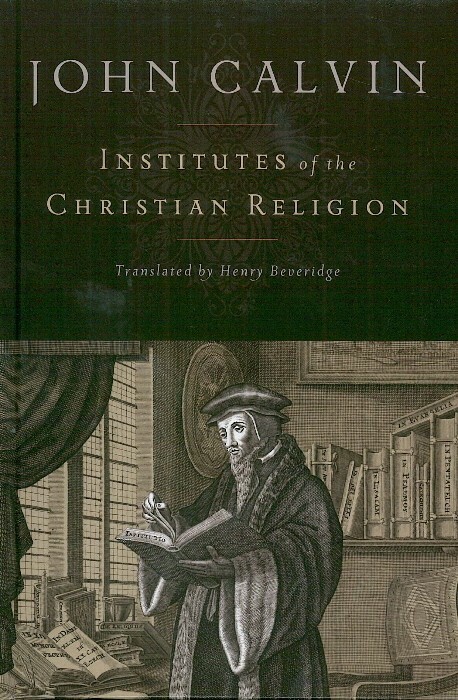 The Institutes of the Christian Religion by John Calvin is available for purchase in hardback here and is accessible for free online reading here.